As the first adopter of IntakeQ, I can say by experience that improving something seemingly unimportant, like your intake process, can dramatically improve patient satisfaction, and even the quality of the treatment you provide. Before using IntakeQ to handle my intake forms, I used to email a questionnaire to my clients, asking them to print it, fill it out and bring it with them for their first appointment. This process felt a little awkward. I was asking them to use their own ink and paper to print 5 or 6 pages of questions, plus an Informed Consent to Treatment document that they would also have to print and sign. Doing Skype consultations was even more painful. They would have to scan the signed content form and email it back to me. This less-than-ideal process was what led me to start using online intake forms, but as I started to use it, I noticed other surprising benefits. I had never noticed how unpleasant it was for my clients to fill out my paper intake forms until I made the switch to electronic forms. Suddenly, I started to get comments about how nice it was that they could do everything online, and how they disliked to use paper intake forms with other practitioners. Since I wasn’t using paper intake forms, they felt pretty comfortable telling me how they really felt about them. This is the biggest benefit for me. Before using IntakeQ, I wouldn't have access to the intake form until the appointment, which was clearly not enough to create a plan of action. Since I wasn’t an experienced practitioner yet, I needed time to prepare for appointments. Being able to read about my clients’ history and goals at least one day before they were sitting in front of me was a big deal. It completely changed that initial meeting outcome. Instead of using it just as a means to collect information, I was actually able to start them on a treatment right away. Now that asking my clients to fill out forms wasn’t awkward and inconvenient anymore, I started using revisit forms with my existing clients before every appointment. I made this short 6 question form that would give me an idea of how they were responding to my treatment. This gives me the opportunity to know what is going on before each appointment and document their progress in their own words. Having the patient's insurance information ahead of time allows me to verify his/her eligibility. Any insurance issue can be resolved before the patient is in my office, waiting to be seen. It’s amazing how many excellent professionals don’t know how to present themselves in this digital era. Offering a convenient and aesthetically pleasing experience to your clients will set you apart from crowd. I immediately started getting compliments on how my forms looked so modern and professional, which would never have happened before. And because my forms are customized, that positive experience is associated with my brand. Automating your intake process eliminates labour and resource costs associated with paper-based systems. No more scanning or transcribing your patients' forms. 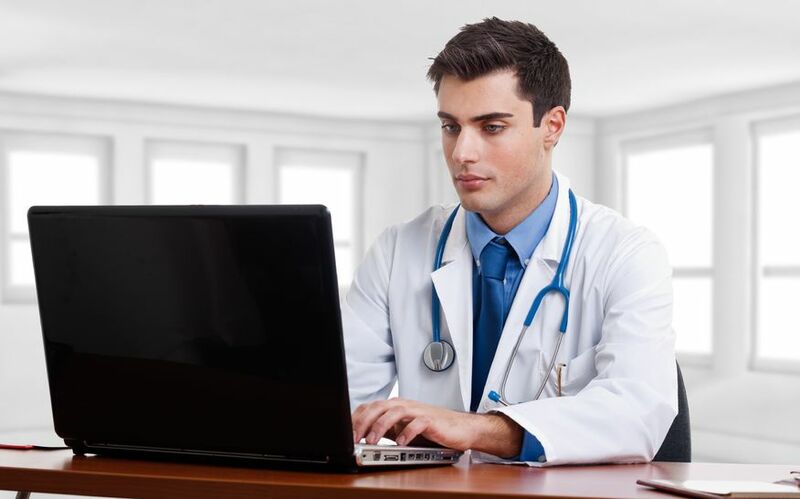 Additionally, storing digital patient information in your hard-drive is not advisable. A single hardware failure (it happened to me before) will make them vanish forever. That’s the huge benefit of using the appropriate cloud service. You know that your data is always backed-up, and you are able to access it, wherever you are, whenever you need it. Dealing with patient’s private information can become a big headache. You want to make sure you are complying with regulations (HIPAA, PIPEDA, etc) and avoid the severe penalties. That’s another reason for using a service that is compliant. You can let the experts deal with the mandated technical requirements while you focus on providing value to your clients. If you want to see these benefits in your own practice, sign up for our free trial and start using e-forms with your patients today. 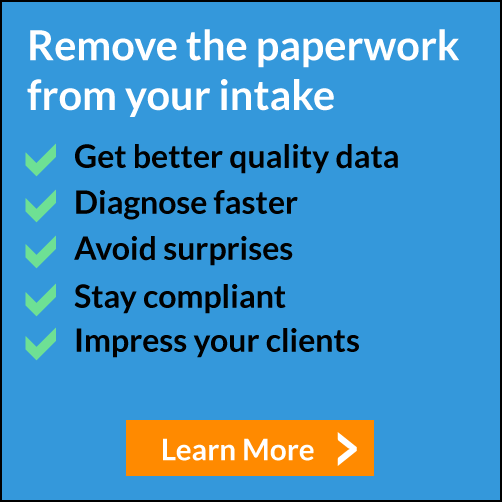 Here at IntakeQ, we think that the role of intake forms is underplayed. We see them as the first interaction between you and your newly acquired customer. Our goal is to make the intake process as smooth as possible and help you look awesome.